Whenever there's a mystery regarding a "missing" email, the first thing we look at is if the email is sitting in a spam filter. We always recommend just using one spam filter, preferably "in the cloud" so mail is filtered BEFORE it gets to your mail server, and distributed to your laptop, smartphone, iPad, and wherever else you read your mail. Recently, I installed a new solid state drive in my laptop, and when I had problems with moving over the disk image, I ended up re-installing Microsoft Office. 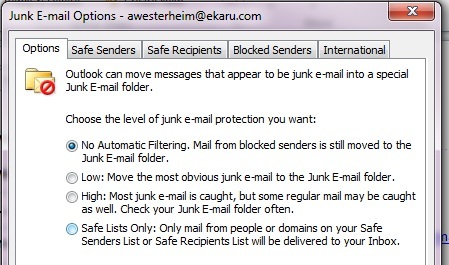 I didn't realize it at the time, but when I completed the installation, the "Junk" filter was turned "on" by default, and I was breaking one of my major rules - I had TWO filters guarding my mail. A few weeks ago, I was looking for a mail message that I couldn't find, and thought perhaps I had deleted it by mistake, and didn't think much of it. Just this week, a client mentioned an mail message he had sent, and I couldn't find it. "Search" of my inbox didn't reveal the message, but when I looked at the mail history in the "People" pane, there it was. It was sitting in my "Junk" box, which I never check because I'm opposed to using it in the first place! Changing your "Junk" settings is easy. 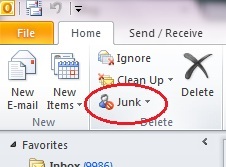 On the "Home" tab in Microsoft Outlook 2010, click on "Junk" in the upper left hand corner. This will open up a window where you can change your settings. In the main tab, "options", you can turn off the Junk filter, or select an appropriate setting if you want. 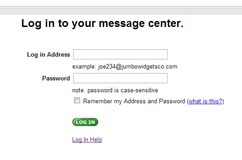 You also have the option to select "Safe Senders", "Safe Recipients", "Blocked Senders" and "International" settings. The built in Junk filter does provide a lot of options, and will work well if the only place you read your mail is in Outlook on your main system. But these days, with so many other devices, we highly recommend a cloud based spam filter so you mail gets filtered BEFORE it gets to your mail server, and you have only one place to check for the invariable "false positives" - those messages that you DO want to receive that get falsely dispositioned as spam. Next time you find yourself searching for a missing email message, make sure you have only one spam filter running! Two spam filters are NOT better than one!